Born in El Verger, she began her musical studies at the music school El Verger Association under the tutelage of the director Eduardo Arnau Moreno and the Flute teachers Thomas Estornell Clemente and Rafael Cremades Bo, she ended the Elementary Level at the Conservatory Tenor Cortis of Denia. She continued her studies at the Professional Conservatory of Music in Valencia, where she got the professional title of Music in the specialty of Flute and in 2000 she got at Joaquin Rodrigo Conservatory in Valencia, where she was a member at the Flutes Orchestra , she completed her studies with the professor Joaquín Gericó Trill. .
She has done courses with Antonio Arias, Francisco Javier Lopez, Benoit Fromanger, Vicens Prats. In addition, she holds a degree in Art History from the University of Valencia. She has played at: the Philharmonic Orchestra of the University of Valencia, as flute-piccolo, where he worked with directors like Christopher Soler, Juan Luis Martinez and Jorma Panula; Band of the Federation of Music Societies of Valencia, as piccolo; Orchestra of High Navy; as well as other chamber music formations. 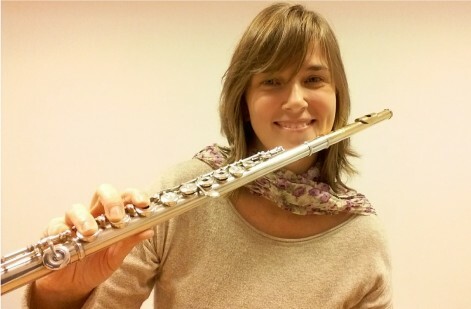 Since 2004-2005 is member of the team of Music and Performing Arts of the Government of Aragon; she works as a professor of Flute at the Conservatory of Music in Alcaniz (Teruel), and is member of the “Quintet Verger”, with it she has recorded her first CD “Paisatges of mà”.